The first of many new Hondas I have purchased over the years was this year of Honda . I was sixteen and my dad told told me if I wanted to continue racing I would have to purchase my own equipment. So this particular year is nearest to my heart. 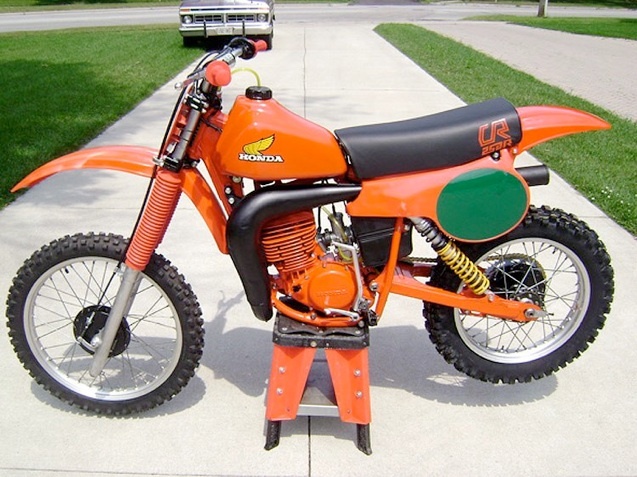 Later in life I began the quest for a bike to rebuild and came upon this beauty. As you can see from the “before” picture it was a little rough (check the forks mounted backwards). I tore it down to the bare cases and began my project about a year ago. I did all the work myself including painting,rebuilding etc. Every seal and bearing is NOS Honda. There are a few things that are not original so I slapped on some new Ohlins, Circle K pipe and raced it in our vintage nationals (check out the holeshot). After this race I realized the short comings of the forks and have recently mounted 1982 CR480R forks with Racetech emulators. This my first restoration and I am presently In the process of doing another 1980 CR250R show bike and a 1980 CR125R.